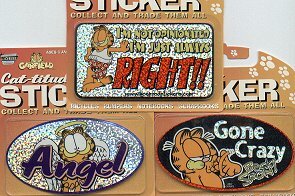 Here are three different Cat-titude stickers from Garfield (Gone Crazy, Angel and I'm always right). Each reflective sticker is approximately 3 1/4" wide x 1 3/4" high. Select the sayings you enjoy. There are two other Garfield stickers at Garfield Stickers II.